If you learn better visually, we've provided a step-by-step tutorial with photo instructions. Early in the day or the day before: In a large bowl cream the shortening and the sugar. Add the eggs, extract and milk. In a medium bowl mix the dry ingredients with a wire whisk. Add the dry ingredients to the large bowl. Mix with mixer until well combined. With hands, shape dough into a ball. Wrap with plastic wrap and refrigerate for 2 to 3 hours. Preheat oven to 400 F. Lightly grease cookie sheets. Roll** half or 1/3 dough at a time, keep the rest refrigerated. For crisp cookies, roll dough, paper thin. For softer cookies, roll 1/8 " to 1/4" thick. 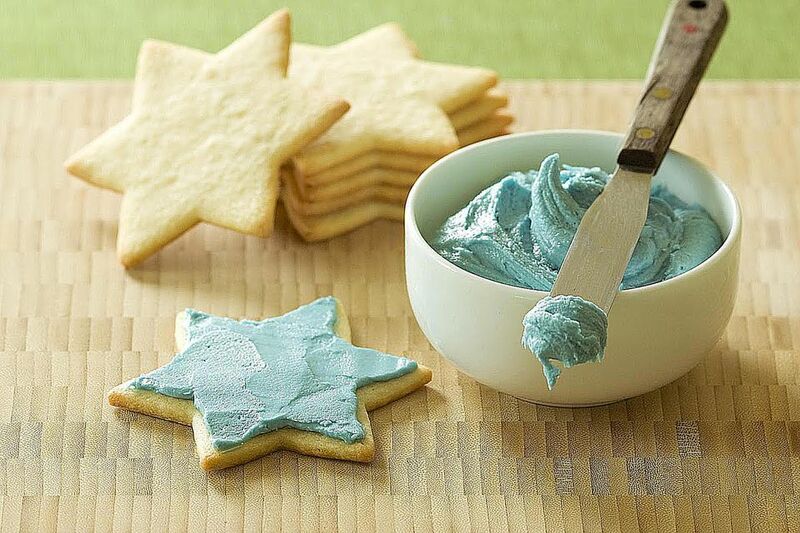 With floured cookie cutter, cut into shapes. Re-roll trimmings and cut. Place cookies 1/2 inch apart on cookie sheets. Decorate*** Bake 8 minutes or until very light brown. With pancake turner, remove cookies to racks; cool. Makes about 6 dozen cookies. ** Rolling Hints: Sue B. says: " Roll the dough out BEFORE chilling and then chill. I roll out my sugar cookie dough right after it is mixed up between 2 sheets of waxed paper, place it on to a flat baking sheet and put it in the fridge. Continue until all the dough is rolled out, stacking the dough sheets on top of the first one. You will go through a lot of waxed paper, but the convenience is worth it for me. When you're ready to cut them out, take out one sheet at a time, peel off the top waxed paper, lightly rub some flour onto the dough, replace the waxed paper and flip the dough sheet over. Peel off the now top sheet of waxed paper and you're ready to cut out your cookies. Collect the dough scraps in a plastic baggie so they don't dry out, re-roll when you have enough for a large sheet. I reuse some of the waxed paper sheets for re-rolling the scraps. A couple tips..... If the waxed paper slips on the counter while rolling, wipe the counter with a damp cloth. And while rolling the dough, sometimes the bottom waxed paper wrinkles, flip over the dough and waxed paper, release waxed paper and re-roll. This method of rolling out cookie dough has been a real time and mess saver for me." ShadoeRose says: "I have found that it is difficult to roll if attempting to do so immediately after taking out of the refrigerator. Take a portion of the dough out and put the rest back in the refrigerator as you don't want the dough to get to room temperature. Let the piece you are working with, warm slightly but keeping beneath room temperature. Experiment with different lengths of time of warming until you find the temperature you find the easiest to work with." ***To decorate with colored sugars: Prepare cookies by brushing with heavy cream or an egg white slightly beaten with 1 tablespoon of water. Sprinkle with decorative toppings. ***To decorate with food colors: Mix 1 egg yolk and 1/4 teaspoon water. Divide mixture among several custard cups. Tint each with different food color to make bright colors. (If paint thickens while standing, stir in a few drops of water.) Paint designs on cookies with small paint brushes.